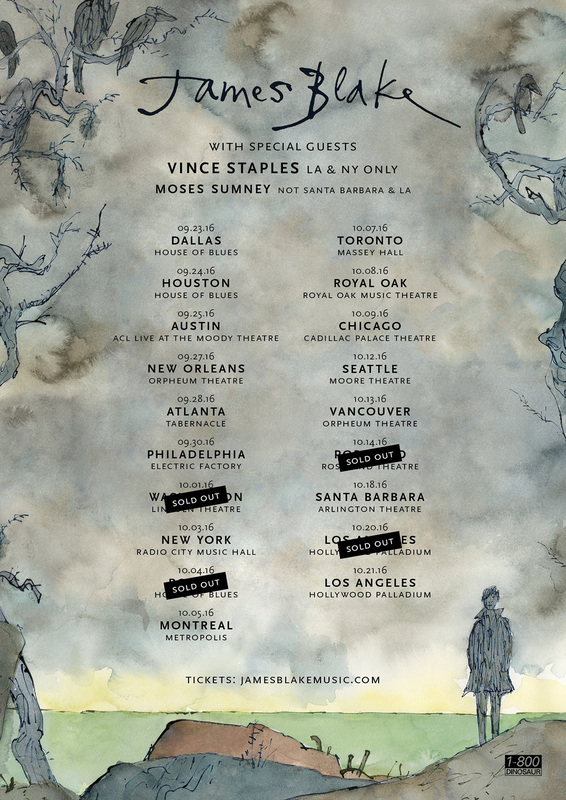 James Blake has just announced that he will be joined by Vince Staples and Moses Sumney for certain dates of his fall tour. Sumney will be at every stop except Santa Barbara and Los Angeles, while Staples will only be at the New York and Los Angeles shows. Check out the full list of tour dates below. Blake recently worked with Staples on his EP Prima Donna. The two also appeared together at Glastonbury on Blake’s tune “Timeless”. The track is from his third full length album The Colour in Anything which is out now via Republic Records. Besides working with Staples, Blake has been busy collaborating with other artists as well. He can be heard on Beyonce’s “Forward” from her latest album Lemonade. Blake has also recently worked with Frank Ocean on both The Colour in Anything as well as Ocean’s Blond.